This is the tale of three siblings – non-identical triplets, to be exact. All born of the same mother (Ford), none sure of who their baby-daddy is, and all endowed with characteristics that separate them from each other. 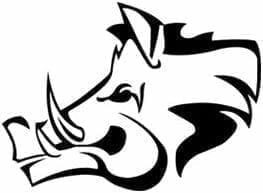 Yet all instantly recognizable as family. I spent a week with each of them, and they’re all great trucks – there’s a reason the F-150 is a perennial best-seller. 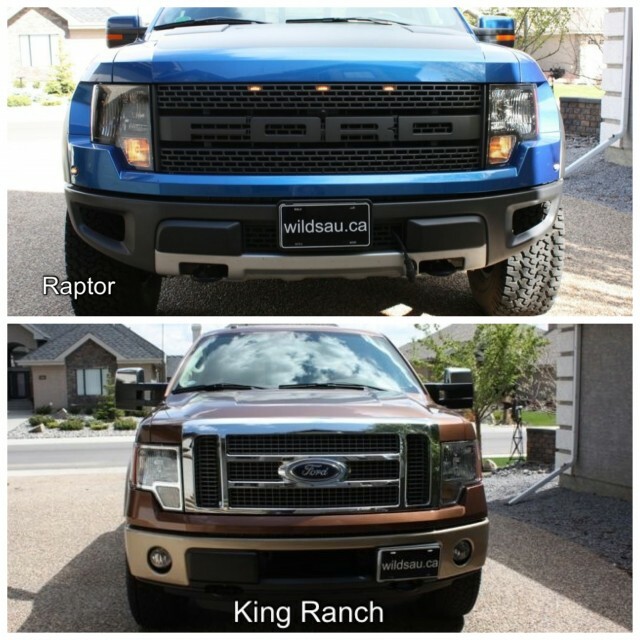 It’s a great truck, and it makes for a great foundation to build special editions, such as these, on. So let’s meet this square-jawed, chin-stubble-wearing family, shall we? 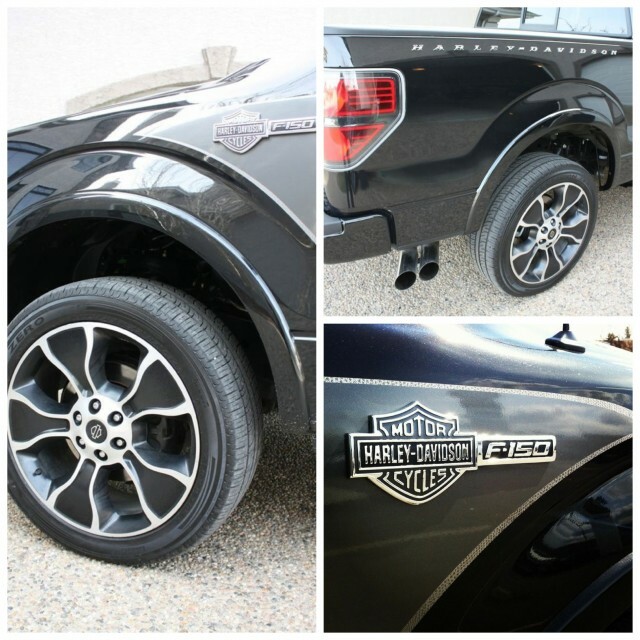 The Harley-Davidson F-150 is the most expensive one you can get. It starts at CDN $56,699. It’s powered by a monster 6.2-Litre V-8, churning out 411 HP @ 5500 RPM and 434 lb.ft of torque @ 4500 RPM. It’s rated to get 18.5 L/100 km (12.7 mpg) in the city and 12.7 L/100 km (18.5 mpg) on the highway. The Raptor isn’t cheap either. It starts at CDN $55,999, and is powered by the same magnificent engine, but rated even higher on the “I’m going to kill this planet off on my own without any help” meter. They say it’ll get 19.1 L/100 km (12.3 mpg) in the city and 14.2 L/100 km (16.6 mpg) on the highway. I averaged exactly the same for both of the V-8 powered trucks – 21.9 L/100 km (10.7 mpg), during mostly city driving, with no real effort to save on fuel, but not driving aggressively either. Yowzers. Regardless of how you drive, you’ll find yourself at the gas pump a lot. And it won’t be cheap, because all three of these trucks sport 136 Litre tanks. 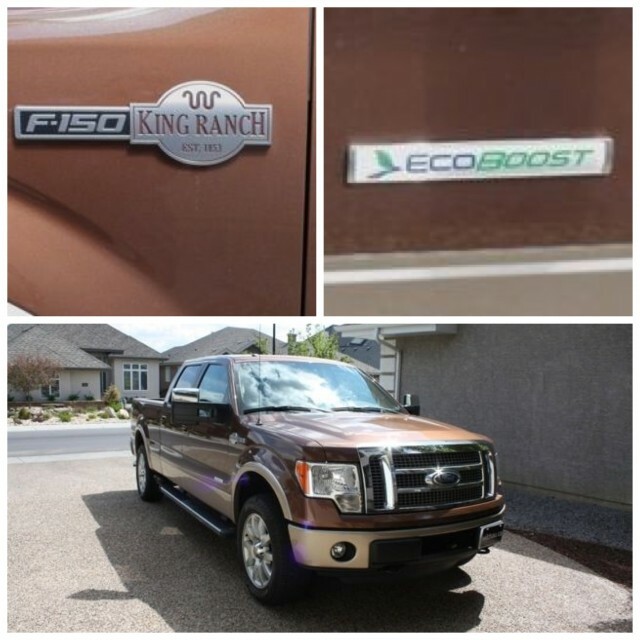 The King Ranch F-150 is the bargain of the bunch, but still starts at CDN $50,099. I guess they’re not giving trucks away anymore. It’s powered by Ford’s wonderful EcoBoost engine – in this case, the 3.5-Litre V-6. The twin-turbo wonder puts out 360 HP @ 5500 RPM. That’s all very nice, but what matters more is that it has 420 lb.ft of torque on tap at a low 2500 RPM. It’s fuel economy is rated at 15 L/100 km (15.7 mpg) in the city and a respectable 10.5 L/100 km (22 mpg) on the highway. My average was 15.7 L/100 km (15 mpg). Much more respectable, right? Well, not really. Because this included well over 300 kilometers of highway driving. There’s no take-away lesson here. If you’re buying a half-ton truck and looking to save the planet with your fuel consumption, you’ve got other, more basic things to figure out. I’ll let you work on those. Come back and see us when you’re walking upright. The basic shape of the F-150 doesn’t change much and remains instantly recognizable throughout the three trucks. The Harley-Davidson is a pretty ostentatious fella. There’s the badging, of course – it shows up on the cowl and the upper part of the truck box. There’s the stylized flame down the side of the truck that contrasts with the paint color. And there are the gargantuan 22″ rims – which look awesome – shod with massive rubber. 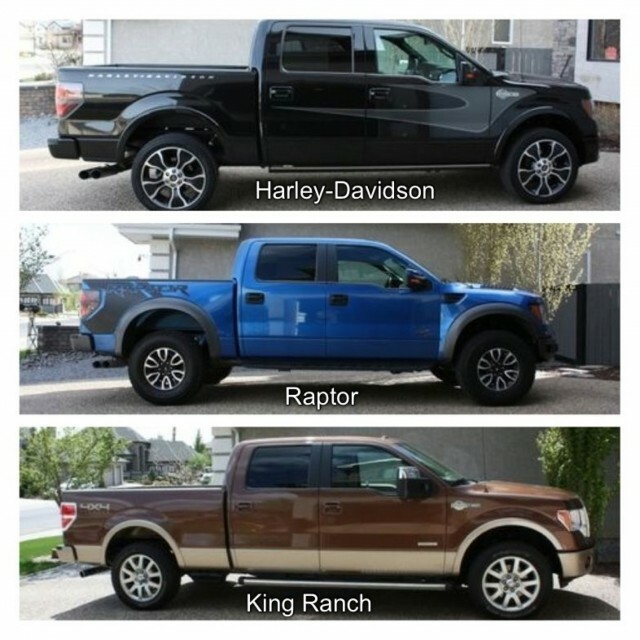 If the Harley is ostentatious, the Raptor is too, but in a different way. It seems as though it has very little to prove, and makes itself known by its presence. Which it has in spades. 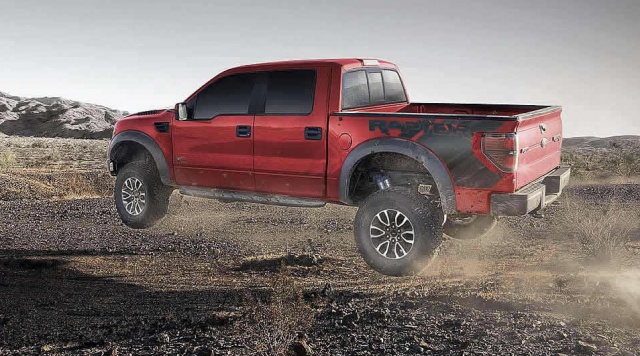 The Raptor doesn’t come across as needing attention, because it exudes confidence. But it certainly gathers crowds. People gawk at this thing. The hugely-flared fenders, the massive skid plates, the raised stance and the huge 315mm wide rubber don’t do anything to calm the natives. The Raptor-specific hood with heat extractors and the cool orange driving lights glowering at you from that grille the size of Mongolia complete the look, along with the optional Raptor graphics package down the side. I had a person tell me that they thought the truck wanted to eat them when I was behind them at a red light. Maybe not eat you, sir, but perhaps just roll over you considering how long it took you to get a move on… Did I mention that the Raptor is wide? Yeah – 7″ wider than an F-150. HELLO! A final note here – I loved the Raptor’s new wheel design, where I hated last year’s. 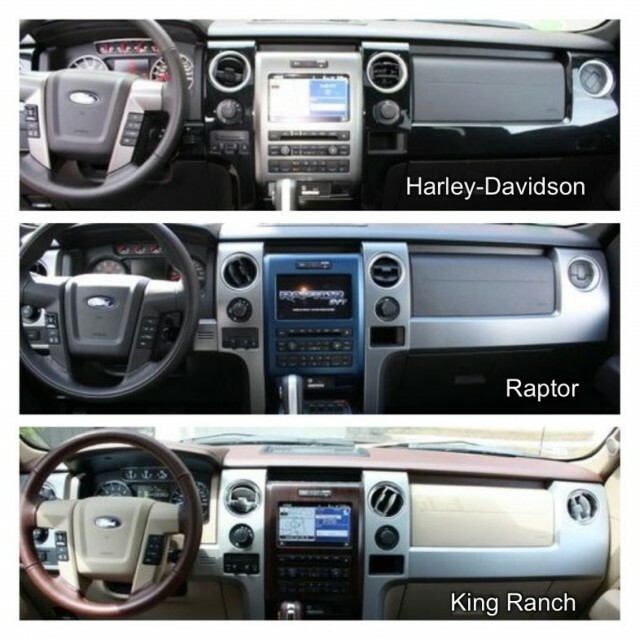 The King Ranch felt like the grown-up older brother of the other two. It’s a much less visible truck on the road. It came in a nice metallic brown, which looked fantastic, and it was offset by handsome wheels, and discrete King Ranch badging. Other than that, you might not give this truck another look – unless you were into looking at F-150s more than once when they drive by. Getting from the outside into the interior is the best with the Harley. It has the motorized drop-down side rails – open the door and they just swing down. And back up again when you close it. It doesn’t get any better. 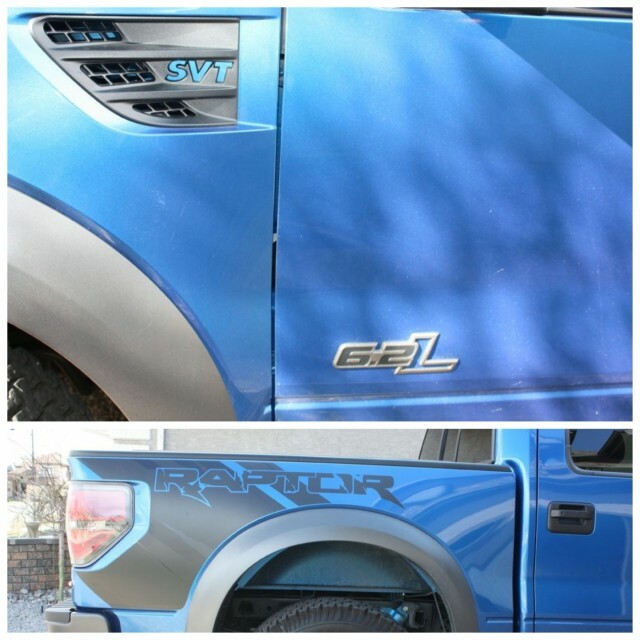 The Raptor’s side rails are rugged-looking slatted affairs that have a tough finish on them. 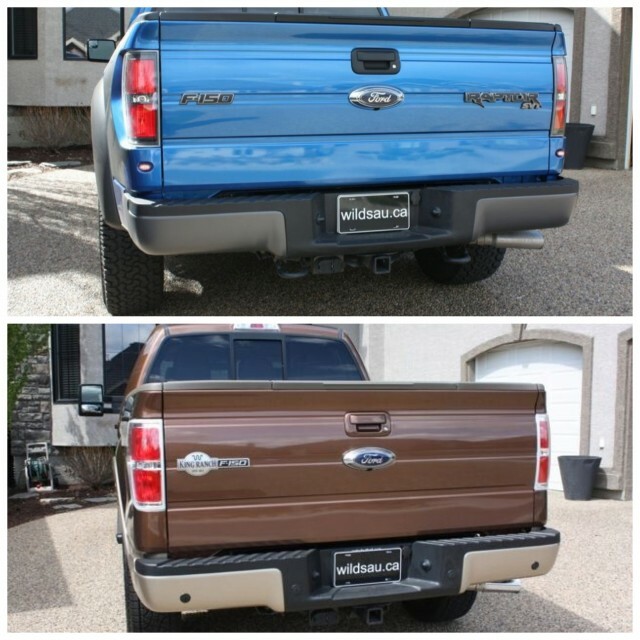 The King Ranch’s side steps are stationary like the Raptors, and are shiny chrome. Once you’re in, the interiors are not easily distinguishable until you look at the details. Let’s talk about the common ground first. Head room is great, and leg room/knee room is exemplary. The materials, whilst being hard plastics, are nice to look at, and work well for a truck and the fit and finish is top-notch. Seats are power-adjustable, heated, cooled and extremely comfortable in all three. There’s driver’s side memory, and a distinct lack of bolstering – all three could do with more of it, but they’re all exceedingly nice places to be during every-day driving. The steering wheel is comfortable and has controls for the media system, cruise, hands-free operations and the phone. Behind the wheel, you’ll find a highly readable set of simple gauges, flanking Ford’s fantastic driver information screen, which is also controlled by buttons on the steering wheel. The center stack starts with the touch screen. Below that are a well thought-out series of hard buttons supporting the screen and its systems, and further down the dual-zone, automatic climate control. At the bottom of the stack are the auxiliary and USB plugs, as well as a true-blue cigarette lighter. To the right of the stack is another 12V plug, and to the left you’ll find the 4×4 control, via a rotary knob, and below that the trailer brake controller. The wide console houses the shift lever on the left, and 2 inline cupholders on the right. Behind them sits a wide and comfortable armrest. 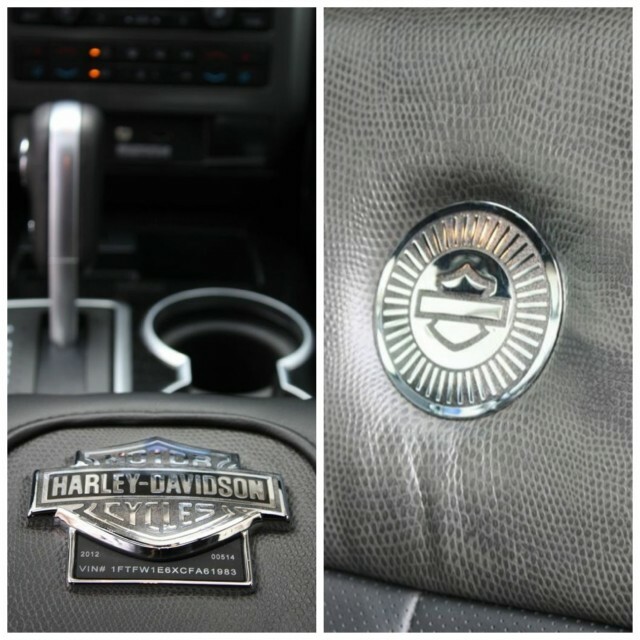 The Harley brings more branding to the inside. There is badging on the seats (front and back), and groovy(?) snakeskin inserts on the seats, the steering wheel and on the armrest lid. Speaking of the armrest lid, it also has a serialized plate, with a big Harley-Davidson badge. The screen displays the Harley-Davidson logo when you fire up the truck, and they’ve used the Harley-Davidson font on the gauges. The trim plates inside are a metallic sparkly black. The Raptor has body-colored inserts on the dash and door panels, and it has Raptor seats with branded stitching (front and back). The King Ranch brings beautiful grained leather to the table, with contrasting piping and stitching. It looks (and feels) like a high-end leather accessory. It has a classy faux wood trim on the center stack and the door panels, with a nice contrasting color scheme throughout. There is a big King Ranch logo on the armrest lid. Regardless of which of these three contenders you choose, you’re going to be sitting in the lap of luxury. What I’m saying is these aren’t interiors that are luxurious for a truck. These are simply luxurious by any standards, and other manufacturers could learn a thing or two about doing a high-end, luxurious interior without getting too complicated or pretentious. Well, the Harley is pretty pretentious. I’ll give it that. You’ll find practically everything under the sun in these trucks, and I never found myself wanting something they didn’t offer. Of course, there are power locks, windows and mirrors – the Harley and the Raptor’s mirrors were power-folding. The MyFord Touch system has been improved, and although it can still irritate and still packs a lot of functions into a touch-screen system, it reacts more quickly and is easy to learn. I find myself significantly less annoyed by it than in the past, where I’ve complained about it bitterly. I think Ford has done a good job updating it, and I’m certain they’ll continue to refine it based on consumer feedback. The screen also doubles as the back-up camera monitor – and that is complemented by the audible parking distance sensors when backing up. The Sony stereo feeds off of AM, FM, satellite, CD, auxiliary and USB sources. It includes a center channel and a subwoofer and sounds absolutely fantastic. Overhead, you’ll find a tilt/slide sunroof and controls for a power-sliding rear window and the HomeLink garage door openers. There is a total of four 12V plugs in the cabin – very travel and work friendly. Finally, I just want to give another nod to Ford’s driver information screen. It’s one of the few that I’d consider near-perfect in the industry. It’s consistent throughout their product line, and it offers a wealth of information, ease of use and navigation, and just makes sense to me. The Raptor has a control box on the console, which houses hill descent control and off-road mode buttons, as well as 4 flip switches to power on wired accessories such as light bars or a winch. The driver information screen includes truck apps, which allow you to see what angle you’re motoring along at – front to back and/or side to side. And perhaps the coolest tech gadget in a vehicle yet? A front camera, residing in the grille including a sprayer to clean the lens. Its feed shows up in the driver information screen right in front of you, and it allows you to see what’s directly in front of you if you’re climbing up and down some goodies you’re not familiar with. Brilliant! The amount of room in the rear seat of a Ford F-150 SuperCrew cab never fails to astound me. Simply put, you’ll never need more. Leg-, knee- and foot room border on the ridiculous, and I had a 6-1/2′ tall friend sitting back there, able to stretch his legs out. Headroom is also good. And because it’s so wide, you’ve got room for three bona fide adults. There are three full-size seats, three headrests and three seat belts and a flat floor makes the middle seat a usable reality. Which is rare these days. The seats are very comfortable, and the two outboard ones are heated. All three models took their themes to the back seats as well, putting badging, stitching or embossed logos on the seatbacks. In terms of space, you can increase it almost exponentially by flipping the seat bottoms up and out of the way, leaving you with a space that could easily transport a loveseat. And because the seat bottoms split 60/40, you can transform that space with great flexibility, leaving substantial seating for one or two adults or kids, and making space for a very large item beside them. 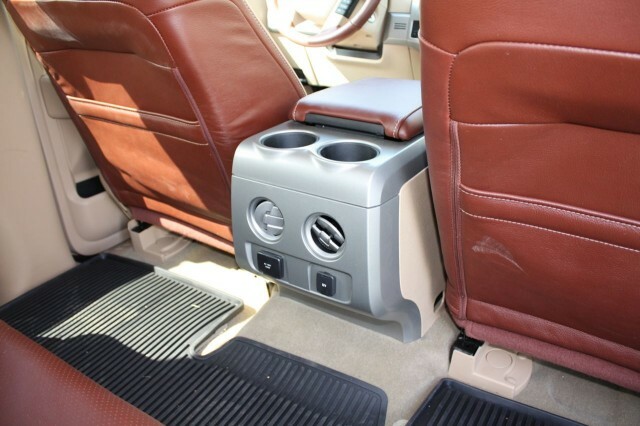 The back of the center console has two large cupholders, adjustable air vents, a 12V plug AND A 110V REGULAR HOUSEHOLD OUTLET. Hello! Every car should have one of these! For storage, you’ve got two seatback map pockets (the Harley’s are zippered with a branded zipper pull!) and large door pockets which include a bottle holder. 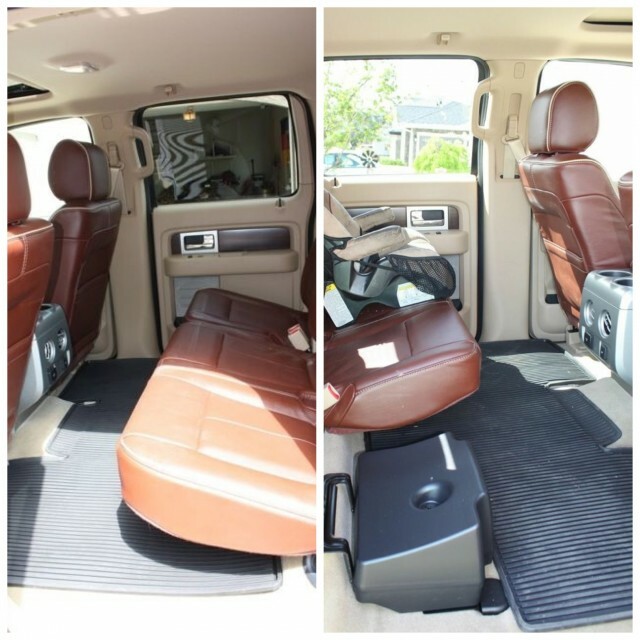 If you even have to ask, transporting children is an absolute breeze – you’re provided with 2 LATCH connectors and room to spare! All three models had additional goodies to help access the box. Although some snicker at these as limp-wristed, city-slicker ways of doing things, you’d be lying if you said you didn’t love the tail-gate step and the flip-up grab bar. 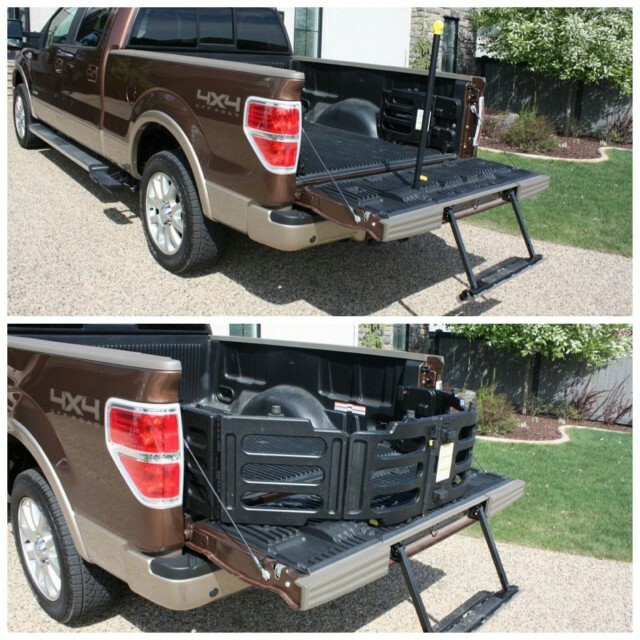 Both are integrated into the tail-gate itself, and make getting up into and down from the truck box a breeze – something you’ll be very grateful for if you’re loading or unloading a ton of stuff. We went to the lake with one of these trucks and it made the loading process a snap. There’s nothing goofy about these innovations – they simply make sense. There’s also a stowable bed extender, which allows you to increase the real estate back there and keeps things in place, even if the tail-gate is folded down. The King Ranch had side steps as well, which are right behind the cab. They can be opened and stowed with a quick kick of the foot, and make it easy to access what’s in the front of the truck box. Nice touch. Inside, you’ll find a smallish glove compartment, a tray on top of the dash and a small cubbyhole in the dash. There are long, skinny door bins in the front and they have integrated bottle holders. There’s a neat long bin on the right side of the center console. 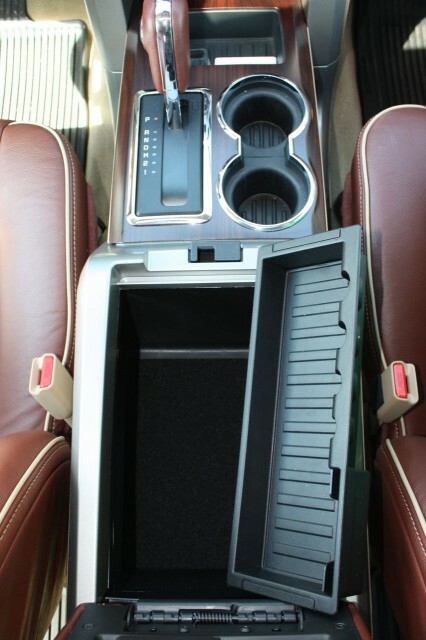 I liked the large open bin at the front of the center console – it’s deep and has a rubberized bottom. The Raptor’s off-road control buttons delete this bin. There is a massive carpeted bin under the armrest lid. It contains another 12V outlet, as well as numerous clips for pens, etc on the lid, and a removable, sliding organizer tray. These trucks are all excellent drivers, yet each has its own personality. The Harley-Davidson and Raptor share a familial rumble – the hairy-chested BRAAPPP of the 6.2-Litre V-8 is something to behold, and for me, it’s music to my ears. It’s a deliciously-tuned exhaust note, and one of the best I’ve heard. The V-8 provides ample power off the line, and does so in a smooth, linear fashion. There is nothing bad I can say about this V-8, other than the fact that it wilts our planet every time you step on the gas. With great power comes great fuel expense. The Harley-Davidson is a truck that seems to want to shout at all onlookers and let them know how bad it is. And how much trouble it can cause. But for all that, it seems to come across as a bit of a poser. Underneath all the badging and the name, it’s a slick operator and just goes about its business without making a fuss. The Raptor, on the other hand, does the same, but it CAN cause a lot of trouble. The off-road capabilities of this beast are simply breath-taking, considering it’s a factory truck. This truck will go places where others can’t. It’s not merely a badged-up “Off Road” edition truck. Everybody has one of those in their line-up, and they’re little more than a different suspension and a skid-plate at times. The Raptor offers FOX Racing Shox, which soak up hits off road like nobody’s business – I took it off the beaten path, and nothing threw the suspension for a loop. There’s a significant amount of travel (11.2″ in the front and 12.1″ in the rear). In plowing through 12″ of muddy slough water, and taking it through some steep hills of loose dirt, I found there was nothing that slowed the Raptor down. I’m certain I didn’t even approach the limit of what this truck can do. But the real surprise came ON the road. Typically off-road prowess calls for on-road compromise. Not here. If you haven’t driven a Raptor on the road yet, you may well be shocked at how easy and road-friendly it is. The steering is precise, the handling is fantastic, and the brakes are powerful. It’s quite a feat to have managed both facets of this truck’s personality so well. The King Ranch is cut of similar cloth to the Harley’s. It’s a very comfortable truck around town and on the highway. The difference here is the engine. The EcoBoost, though not providing nearly the soundtrack of the 6.2 V-8 in the other two, packs a punch. It summons plenty of jam effortlessly from the line, and remains surprisingly quiet – even under full throttle. All three trucks were very easy to drive and handled well, all three are big vehicles and provide challenges getting into garages or parkades, and all three are thirsty. All three had some wind noise creep in at highway speeds, but nothing that was intrusive nor surprising, since you’re basically driving a vertical brick. I’ve got but a few. I didn’t appreciate that the huge towing mirrors on the King Ranch (significantly bigger than the mirrors on the Raptor or the Harley) don’t offer a power-folding feature. They add about a foot of width to each side of the truck and made getting into parkades a nightmare. The subwoofer takes up all the space under the passenger-side rear seat. It’s not a big deal. The Harley-Davidson font on the gauges makes them harder to read. Is it really that critical to have the gauges sync with the all-important Harley font? Seems goofy. And this might seem trivial to some folks, but at this price point, I’ve come to expect nice bright HID headlights. Frankly, they’re available on cars costing about half as much, and they are nowhere to be found here. I’m not a truck guy, but man, I liked these trucks. The Harley is a nice spiced-up truck. I guess it depends on how spicy you like things. For me, the badging and the flames and everything was a bit much. Especially considering it’s so much more money. A number of people who checked it out chuckled at just how ostentatious it is. Much like a Harley-Davidson bike, it’s not for everyone, but it’s exactly what some people want. I give the Harley-Davidson a 7.5 out of 10. The Raptor is simply the most fun I’ve ever had in a truck. I love the looks and the presence, I love the sound, I love what it’s capable of off-road, and that it can be a well-behaved city dweller all the same. I give the Raptor an 8.5 out of 10. The King Ranch was the least of the bunch when it comes to sticking out in a crowd. Yet it struck me as the most handsome, the least polarizing, and in the end, the most livable of the three. I absolutely fell in love with the interior, and I’ve always been an EcoBoost fan. Sure, I miss the glorious V-8 symphony, but when it comes down to everyday driving, I love the instant torque, and the marginally better fuel economy, thank you very much. And you’ll do much better with it if you’re towing, if you don’t want to step up to a 3/4-ton diesel. I give the King Ranch an 8 out of 10, and the Wildsau stamp of approval – the stamp that says “This is the truck I’d actually buy with my own money if I was going to live with it”. It’s a pretty big stamp. WAF (Wife Acceptance Factor) was middling for the Harley-Davidson. She felt it was just “too much” with the graphics and the badging and the snake-skin. She basically rolled her eyes at it constantly – so now the truck knows how I feel all the time. It got more interesting with the Raptor. She also rolled her eyes at it, and said it’s just ridiculous with how big it is and how loud it is. Yet guess what she wanted to drive a number of times? Mmmm-hmmmmm. And WAF soared when it came to the King Ranch. My wife likes more conservative vehicles as it is, and somehow the down-to-earth classy styling of the King Ranch appealed to her. When it came to practicality and features, my wife loved every one of the trucks – since they are all basically identical in that department. All three of the triplets provide the exact same amount of luxury inside and utility outside – they’re all great rides. So you have to determine which features mean the most to you. Care about looks and making an impression on people? The Harley might be your thing. This might be the middle brother, bearing his hairy chest and watching The Sopranos a lot, and wearing heavy gold chains.If you like off-roading but need to use the same ride for getting to and from your real life during the week, and you can handle driving something that will feature in people’s nightmares, the Raptor could be the answer. This might be the little brother, younger, meaner, and confident because of all the time he spends in the gym. Looking for a handsome, well-appointed truck that does it all, including comfortable cruising in the city and on the highway and towing when called upon? Look no further than the King Ranch. This will be the older brother – kinda done with the showiness, happy to be exactly who he’s always been, and confident in his own right. All in all, it’s a lovely family, the Ford F-150 one. You can look at any of the triplets and say “There’s one in every family.” You just have to pick the one that suits you best. I mentioned earlier that there is no take-away lesson here, but in retrospect, I believe there is one. You see, you can get into a Ford F-150 for CDN $17,999. Sure, it’s a V-6 powered, single cab 2×4, but the point is, it’s the same family. It is interesting to see a truck with the same lineage triple its price. Hey, I guess as long as people keep buying the ones with all the good stuff in and on them, Ford will happily keep building them for us. And it looks like they’ll happily do a bang-up job of it. Disclosure: Vehicles were provided by Ford.